STATUS: Under the dark shadows of the Gotham City night, the city's villains stay hidden from sight. They strike at will and all, even the police, are helpless before them… all, that is, except Batman! For when Batman walks the night, the shadows can strike back! MISSION: Batman inhabits the night, swooping through the darkened skies like a silent shadow to strike at those who terrorize the city. As though a shadow himself, he blends in with the darkness, unseen by the human vermin scurrying in the alleyways below. When it's time to deliver justice, Batman's two Hyper-Speed Stun Rockets make a powerful point! STATUS: When Batman is away… the rats of Gotham City play! And their kind of fun always means trouble to the good citizens of Gotham City! When darkness descends, the villains crawl from their dank holes to prey on the innocent and fill the night with mayhem! 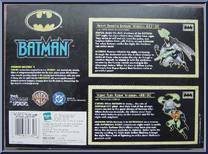 MISSION: While Batman is in Metropolis on a mission with Superman, Robin remains on night watch to tackle any trouble Gotham City's villains may have planned. When the darkness explodes in violence, Robin lights the way by sending his Triple-Bolo Striker flashing through the night like a bolt of lightning to strike down Gotham's greatest evils! Contribute pictures, update details or suggest corrections for Night Shadow Batman & Night Fury Robin. 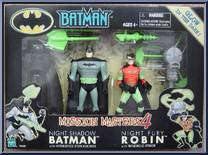 Write a review about Night Shadow Batman & Night Fury Robin.